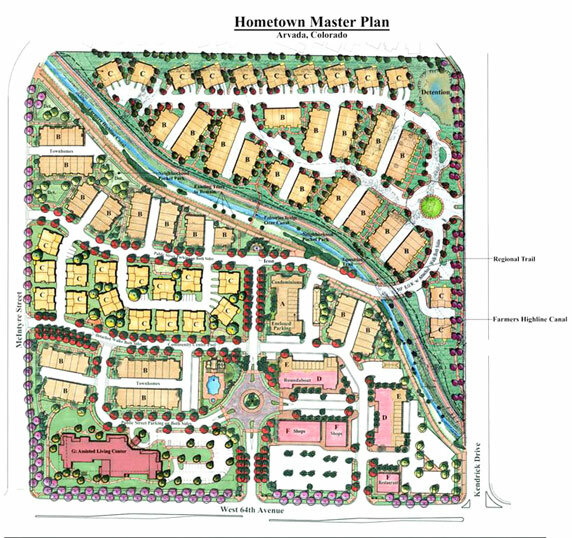 In an effort to buck the trend of urban infill, Century Communities is building “HomeTown,” a sustainable, mixed-use walkable community in Arvada, a suburban community northwest of Denver. This development includes townhomes, three-plex mansion homes, condominiums, assisted-living and a neighborhood retail center. Most internal roads are designed as walkable streets with tree lawns and detached walks on both sides. These walkable streets provide access to future restaurants and neighborhood shops within a quarter-mile radius of all homes. The various homes are mixed and carefully sited to avoid the monotony of having separate uses in isolated pods, creating a look and feel of lower density with an average residential yield of 11 units per acre.